Harrison Ford was "banged up" and receiving medical care following his non-life threatening plane crash Thursday in California, his publicist, Ina Treciokas told ABC News. 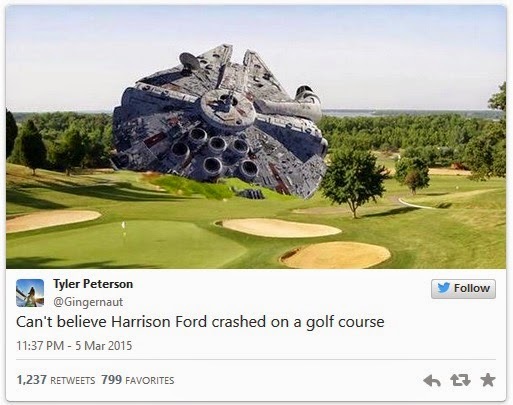 Still, the accident caused quite a scare for his many fans and his "Star Wars" co-stars. Mark Hamill, Peter Mayhew, Billy Dee Williams and others took to social media to share their support for the 72-year-old icon. Other celebs commented on the fact that Ford is "Indestructible" and just happy he's going to be okay. "Here's hoping my buddy comes away with just another scar to match his crooked smile. Speedy Recovery Harrison!" Mayhew, who plays Chewbacca in the epic movies, wrote. Official Trailer for 007's "SPECTRE"
Star vs The Forces of Evil RETURNS! What Do The W's On The Walkers Mean? Trailer for the Greatest Fan Film Ever Made!